When I was in grade school and done with classes for the day, all I wanted was to avoid homework. I'd slough off my Catholic school uniform and watch television or find some friends and get a Wiffle Ball game going. I was kid. That's what kids do, right? They avoid work—or so I thought. These days, I'm a tutor and teacher's assistant at Mighty Writers, a non-profit, educational organization. We tutor Philadelphia area students and teach writing workshops. My original assessment of the childhood desire to avoid work holds true in some of the students—I've caught them hiding under chairs and tables to avoid math problems. But most of them have surprised me. Especially those who take the time to venture to the community garden across the street where they can be found cleaning and planting. One evening, a fourth grade boy—born with a common disorder resulting in the inability to sit still in one place for more than two seconds—was walking through the garden, carefully picking up any litter that hid amongst the soil and plants. It usually takes about an hour to get this bouncing-off-the-walls child to do his spelling homework, yet here he was, taking the time to clean up a garden. There was a group of them that evening. I could hear the excitement in their voices every time they came across a tomato, or some other gem that they themselves had planted. The words "That's so cool!" floated through the garden every couple of minutes. 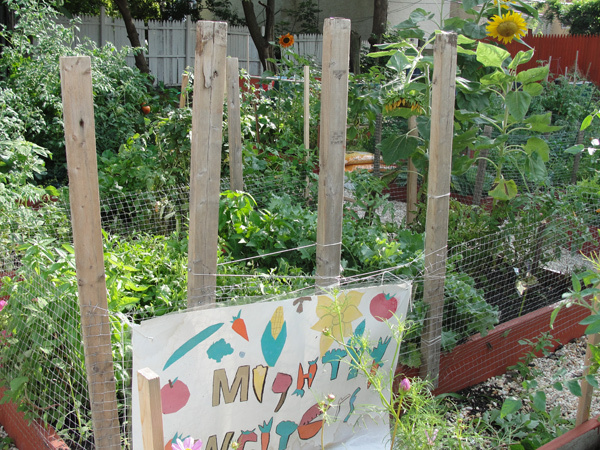 It was refreshing—and inspiring—to see children that didn't have to be in the garden, willingly tending to it. And they did so with awe and respect, making the conscious choice to skip the playground and the video games.﻿ The future looks a lot brighter and greener with kids like this around. Mighty Writers is located on the corner of 15th and Christian Streets. Check them out here.